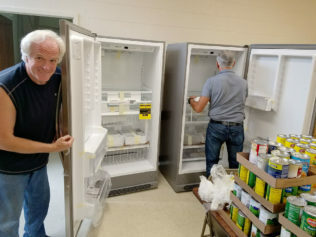 The food pantry at St. Joseph’s Church is now much more efficient thanks to a recent upgrade that includes new shelving, lighting, a commercial grade refrigerator and a restaurant quality freezer. As one of the area’s major resources to help combat food insecurity, St. Joseph’s Church food pantry will now be better able to serve those in need. The project was initially identified through a meeting with Local at Heart President Craig Shankles and Father Sal of St Joseph’s Church and completed through the collaboration and help of The New Paltz Community Foundation, with the generosity and support provided by The George and Catherine Sifre Family Charitable Fund. “It is and always has been our mission at Local at Heart to find creative ways to bring community together to raise awareness and combat the invisible epidemic of hunger in our own backyard,” said Craig Shankles. A ribbon-cutting ceremony will mark the official opening of the new space on October 11, 2018 at 10:00am at St. Joseph’s Church. The public is warmly invited to attend. The Food Pantry is open Monday, Tuesday, Wednesday and Friday 11am – Noon. Visitors can receive food once per month. The charitable organization Local at Heart, along with the New Paltz Community Foundation, has committed to helping make our food pantry here at St. Joseph’s even better able to serve the people who come to us for assistance with obtaining the food they need. They are looking into how we can make the space the pantry operates out of more efficient and able to hold more items. There are also plans to get for us a commercial refrigerator, a freezer and improved lighting. Many thanks to Local at Heart and the New Paltz Community Foundation and God bless them for their desire to help our brothers and sisters in the community that we are privileged to serve. During the summer months when schools are closed, some children go without lunch and breakfast. For some in our area, it’s their only meal of the day. 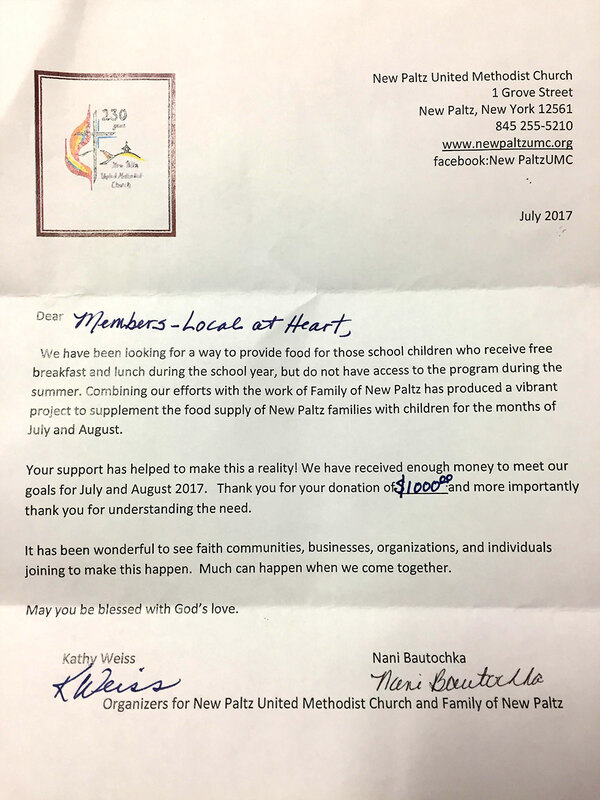 One local organization, Local at Heart, has responded to this shortfall by giving a $1,000 donation to help support the Summer Food Program, administered through the New Paltz United Methodist Church and Family of New Paltz by Nani Boutachka and Kathy Weiss. Church Board Members Nani Boutachka, Kathy Weiss and Executive Director of Family of NP, Ivan Echenique, were on hand to accept the $1,000 donation from Local at Heart Board Members Craig Shankles, Connie Harkin and Linda Engler. Nani and Kathy have been diligent in finding a way to keep the kids that typically receive Free Breakfast and Lunch at school and go home with meals in a weekend backpack, fed over the summer. The two retired teachers established a budget and began fundraising to support the effort. “When we learned of a shortfall, we had to respond. 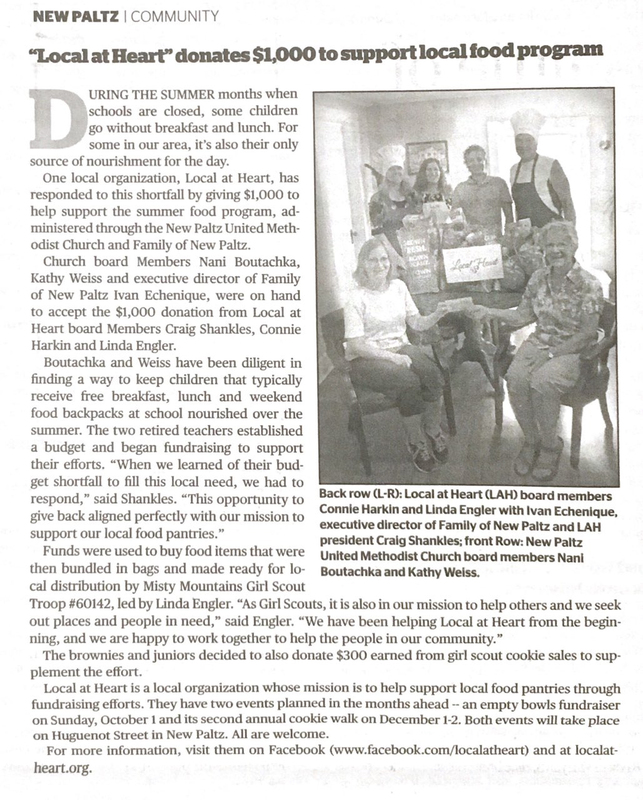 This opportunity to give back aligned perfectly with our mission to support our local food pantries,” said Craig Shankles, President of Local at Heart. Funds were used to buy food items that were made ready for local distribution by Misty Mountains Girl Scout Troop #60142, led by Linda Engler. “As Girl Scouts, it is also in our mission to help others and we seek out places and people in need. We have been helping Local at Heart from its’ inception and we are happy to work together to help the people in our community,” said Engler. The brownies and juniors in the troop decided to use $300 that they had earned from cookie sales to go shopping for food to donate to the program. Local at Heart is a New Paltz-based organization whose mission is to help support local food pantries through community fundraising efforts. They have two events planned in the months ahead. An Empty Bowls fundraiser on Sunday, October 1st and their Second Annual Cookie Walk on December 1st and 2nd. Both events this year, will take place on Huguenot Street in New Paltz. All are welcome.